If you're running a powerful system, the one thing a PC gaming fanatic is a quality case fan to keep things cool. Oh, and it also doesn't hurt if it's bathed a cool wave of gorgeous UV Blue, either. Offering an eye-popping design that is UV reactive, ultra-quiet, and both water and dust-proof, the Gelid Solutions WING 8 - 80mm Gamer Case Fan is a premium quality component that's sure to deliver. Made from only the highest quality materials, this state-of-the-art UV blue cooling fan boasts an enormous amount of features. The supplied voltage regulator offers users the ability to control the fan RPM speed according to your exact specifications. For added silence, fan mounts are included that will provide an excellent replacement to your traditional screws. These mounts are made of high quality, ultra-soft silicone which stop fan motor vibrations from traveling through your PC. 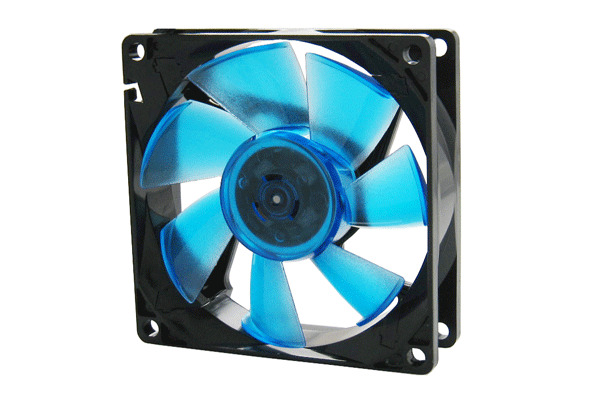 Using it's patented Nanoflux Bearing, this UV Blue 80mm Fan incorporates an innovative magnetic design that is made for noiseless operation, and built to run friction-free. The Nano-technology composite ensures lowest abrasion and extreme durability, and is designed to allow the impeller to be detached, giving you easy access to the fan blades when they need to be cleaned. Add quick and easy installation into the mix, and you're looking at one must-have gaming fan.